After the time of chaos, anger and pain depicted in the Three of Swords, the Four of Swords can signal that it is time to retreat. 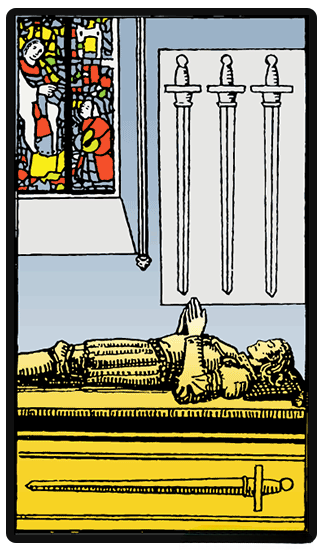 The Four of Swords is a moment of rest. Whether this is from a choice to withdraw, or whether it is from pure exhaustion, it is not clear. We are still tender from the wounds that were inflicted, and the battle weapons still hang above us as a grim reminder of what was lost. In order to continue and re-emerge in your daily life, you must take the time now to take a breather. There is always the faint fear that something more is bound to happen again and it is advisable that you take all chances to rest. The Four of Swords is a moment of rest. Whether this is from a choice to withdraw, or whether it is from pure exhaustion, it is not clear. You need to gain strength and clarity in a quiet environment away from your current circumstances. It is time to re-evaluate, organize and understand your priorities. This helps to rejuvenate one s spirit, and you come out stronger than before. Although the Four of Swords card in a reading could mean it s time for healing, a reversed card could mean restlessness. Your heart is willing to relax, but this is not what your mind wants. You feel that you have too much that is depending on you. Following this path is not advised, as it could have affects on your health. You can continue to fight, but sometimes that is ineffectual and you must have enough awareness of your own strength to decide when to back out. To rest, to retreat, is a means of self love sometimes, and though you may try to push ahead, that will only make it difficult for you in the long term.